Europol releases an annual study of terrorism; the results do not support claims that "(nearly) all Muslims are terrorists"
Islamophobes have been popularizing the claim that “not all Muslims are terrorists, but (nearly) all terrorists are Muslims.” Despite this idea becoming axiomatic in some circles, it is quite simply not factual. In my previous article entitled “All Terrorists are Muslims…Except the 94% that Aren’t”, I used official FBI records to show that only 6% of terrorist attacks on U.S. soil from 1980 to 2005 were carried out by Islamic extremists. The remaining 94% were from other groups (42% from Latinos, 24% from extreme left wing groups, 7% from extremist Jews, 5% from communists, and 16% from all other groups). The results are stark, and prove decisively that not all terrorists are Muslims. In fact, a whopping 99.6% of terrorist attacks in Europe were by non-Muslim groups; a good 84.8% of attacks were from separatist groups completely unrelated to Islam. 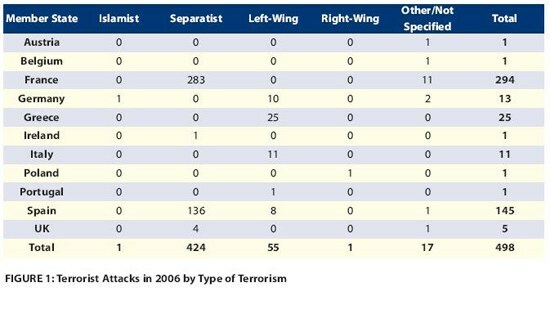 Leftist groups accounted for over sixteen times as much terrorism as radical Islamic groups. Only a measly 0.4% of terrorist attacks from 2006 to 2008 could be attributed to extremist Muslims. 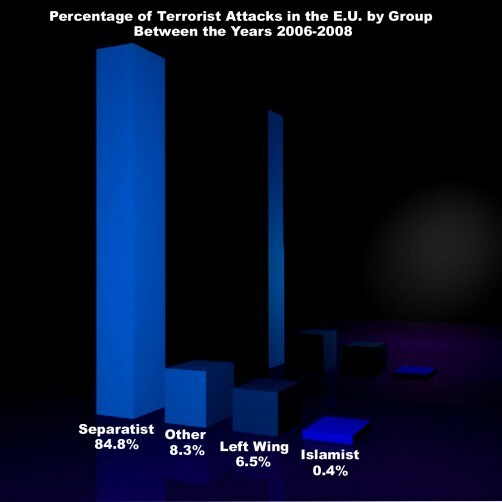 Islamist terrorism is still perceived as being the biggest threat worldwide, despite the fact that the EU only faced one Islamist terrorist attack in 2008. 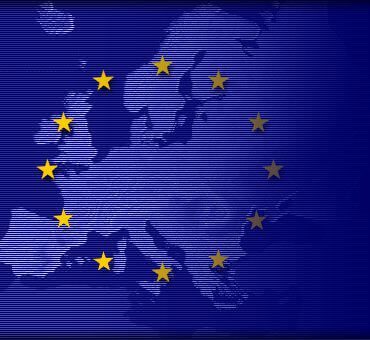 This bomb attack took place in the UK…Separatist terrorism remains the terrorism area which affects the EU most. This includes Basque separatist terrorism in Spain and France, and Corsican terrorism in France…Past contacts between ETA and the FARC illustrate the fact that also separatist terrorist organizations seek cooperation partners outside the EU on the basis of common interests. In the UK, dissident Irish republican groups, principally the RIRA and the CIRA, and other paramilitary groups may continue to engage in crime and violence. Terrorism from Islamic extremists is certainly a cause for concern, but it need not be an issue that creates mass hysteria. Nor should it be allowed to be such a critical issue that we are willing to sacrifice our ideals or civil rights for fear of it. Neither should we be reduced to a status of absolute sissitude. We have analyzed data from America and Europe (a good portion of the entire Western world), and the threat from Islamic terrorism is much more minimal than commonly assumed; in the U.S., it accounts for 6% of terrorist attacks, and in Europe not even half of a percent. It is only through sensationalism and fear mongering that the topic of Islamic terrorism is allowed to be used to demonize a religious community that happens to be a minority in the West. When confronted by such lunacy, we ought to respond with the facts and the truth.